The point I want to make here is that I haven’t banned the practice they are talking about. My duty is to make the situation clear, no more than that. Whether other people pay attention is up to them. I wave to them when I see them, and sometimes they wave back. …they are accusing us for not giving religious freedom and committing discrimination … So, as I said earlier, politically, Tibetan association has never discriminated them, and besides, they have those ID cards … they live in Tibetan settlement camps, treat in settlement hospitals and attend schools; with RC, they travel around India, and with IC, they travel abroad. These are all supported by CTA, otherwise there is no way of achieving it. If we really want to discriminate then we have capacity or power to remove those rights but we have not done that. The Dalai Lama has often spoken against the practice of Dorje Shugden on many public occasions. In the past, he has cited various reasons in support of his ban on Dorje Shugden, from saying that this practice shortens his life, that it encourages sectarianism, to linking the practice with the failure of the Tibetan administration to win independence for Tibet. 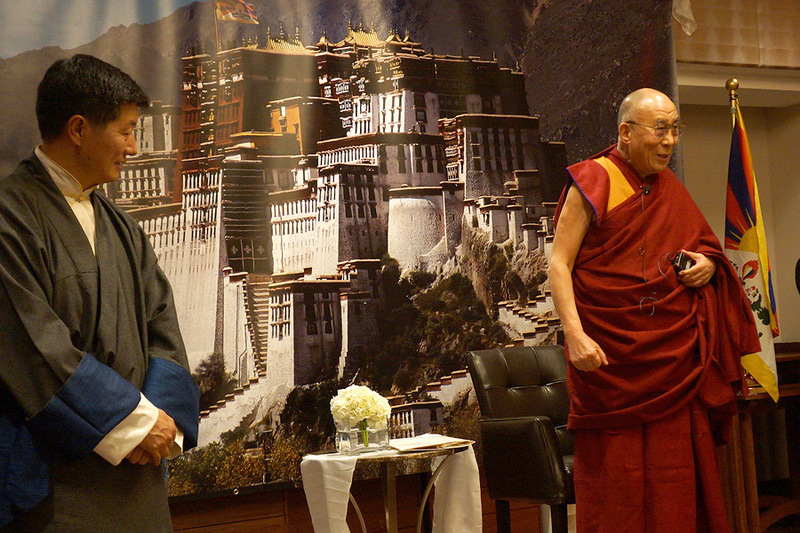 The Dalai Lama brings up the topic of Dorje Shugden at all available opportunities – during his teachings and empowerments, while making official visits to various Tibetan monasteries, even in meetings of the Tibetan Government in Exile. More often than not, any attempt to logically examine the topic of Dorje Shugden degenerates into cheap condemnation of the Buddhist deity and its followers; exhortations to enforce the ban on his practice follow as a matter of course. In a twist of events, the Dalai Lama and the Central Tibetan Administration now say that there is no ban at all on Dorje Shugden’s practice, while at the same time, insidiously claiming that Dorje Shugden practitioners are being funded by China, thus making them the de facto enemy of the Tibetan community. To better elucidate the truth, DorjeShugden.com has compiled a never-seen-before collection of official letters, documents, threats, and other forms of evidence that (despite the best efforts of the Dalai Lama and the Central Tibetan Administration to deny its existence) proves that the ban on Dorje Shugden’s practice does exist, was enforced, and that Dorje Shugden practitioners are discriminated against and segregated as a result. Browse through the collection of documents to see with your own eyes how the ban is affecting the lives of Dorje Shugden practitioners, especially those living in Tibetan communities. From schools to hospitals, from monasteries to convenience stores, each document serve as a constant reminder to the Tibetan exile community to toe the official party line against Dorje Shugden and his followers. Many are coerced into giving up Dorje Shugden’s practice on pain of expulsion from their homes and communities, others are forced to resign from their jobs for sticking with their faith, and yet others are threatened with violence, loss of reputation, death threats and the like. Basic needs such as identity cards, medical care, and travel documents are denied to Dorje Shugden practitioners by the Tibetan government, its departments, officials, and cronies. No matter how the Central Tibetan Administration tries to justify and explain, this is nothing but a clear abuse of human rights and loss of religious freedom. Yet when Tibetan and Western Shugden practitioners take to the streets in desperation to peacefully protest against the Dalai Lama (because all requests for dialogue have been denied), they are crucified by the Tibetan administration and the media for daring to defy a holy being who is supposedly none other than the Saint of Compassion incarnate. This information has been compiled to help speak for the downtrodden Dorje Shugden practitioners whose voices are not heard and who cannot fend for themselves in fear of retribution from the community at large. We at dorjeshugden.com appeal to you, the reader, to look at these documents and have a glimpse of what it feels like to live as a Dorje Shugden practitioner amongst Tibetans who consider you to be a demon worshipper of the worst kind. With a clear mind, unclouded and unfettered by anything else you may have read in the past, judge for yourself whether Dorje Shugden’s practice is banned and his followers discriminated against, or whether, as the Dalai Lama says, there is no ban, and everything is just peachy. And if you find that these documents are proof of a gross betrayal of a country’s citizens by its supposedly-democratic government and Nobel Peace Prize-winning leader, please share this with others. Please create awareness of one of the most overlooked crimes of human rights abuse in modern times. And most of all, please appeal to the Dalai Lama and his government to lift the ban on Dorje Shugden’s practice for good and give the Tibetans true freedom of religion at last. 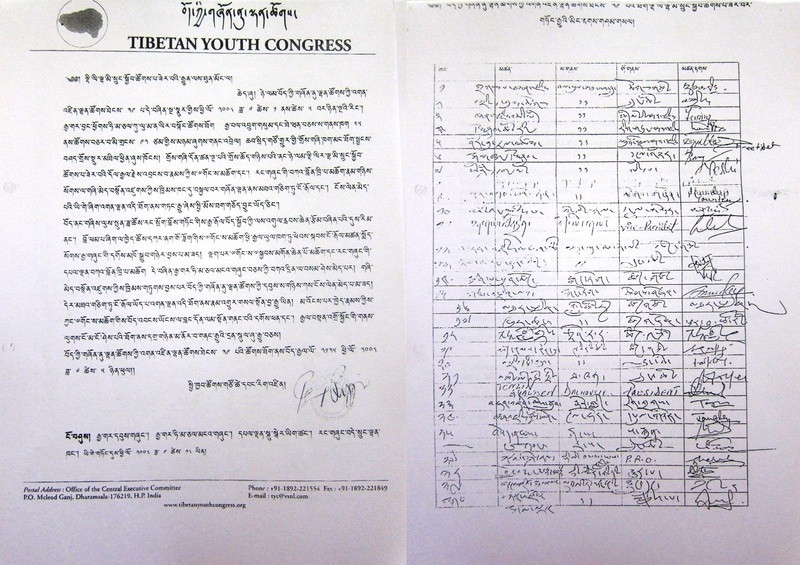 These are just some of the collected documents showing the existence of a ban on Dorje Shugden’s practice, and discrimination against his practitioners. 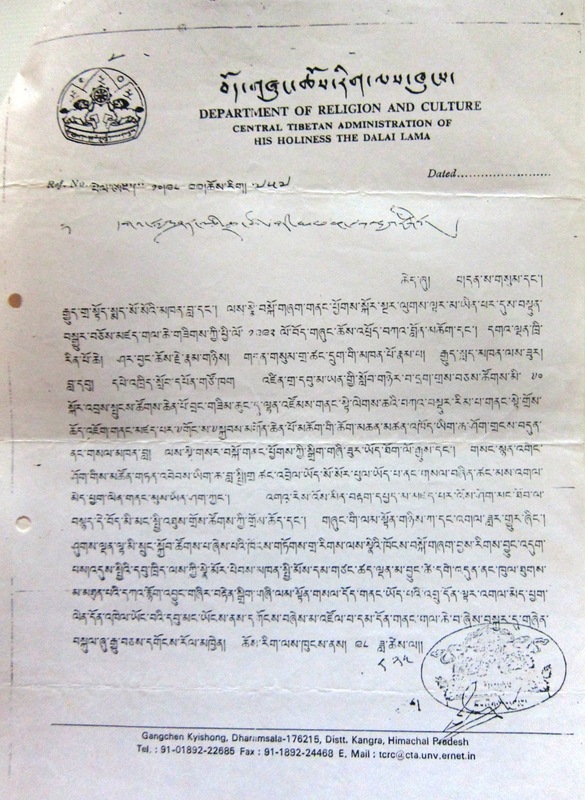 For the full collection of documents in both English and Tibetan, please click here. Thank you for succinctly documenting this modern tragedy. It is quite a destitute situation for Tibetans and the work being done here is much appreciated. We can’t forget to have deep compassion for anyone perpetrating directives like these and remember that delusions in living beings minds are the sole cause for such harmful actions. Oh my goodness, and they say there is no ban? People are told to sign to prove they are not practising Shugden and will not practice anymore. The instructions were clearly to ask their people to give up Dorje Shugden practice and there would only be negative consequences if instructions were not followed. Shugden practitioners are outcasted. If the same strategy to suppress Shugden pratictioners is to apply to drug addict, we will have a more peaceful world. Why this strategy cannot be used? Because it is against human rights! I am shocked and relieved at the same time. Shocked because the CTA and Dalai Lama expect the world to swallow all the lies and half truths about the Dorje Shugden ban. They actually think they can fool everybody. Relieved because there is hard evidence to support there is discrimination and a ban against Dorje Shugden. We had testimonials from monks who were there with Chushi Gangdruk escorting the Dalai Lama out of Tibet to safety, they all knew Dorje Shudgen was behind the planning of the escape to Tibet. Not only that the Dalai Lama carried the thangka borrowed from Trijang Rinpoche. I cannot belief such a ascendant master like Trijang Dorje Chang would resort to not telling the truth, unbelievable. Thank you to whomever did this excellent compilation of evidence. This is a really eye-opening and helpful resource. This is 21st century tragedy to human rights and religious freedom. We are facing some much issues in this world….Nuclear crisis in Japan, Ebola outbreak in West Africa, ISIS threats, Military attack on Ukraine, North Korea poverty and famine….so much people died and suffer unnecessary. We should use religious as a medium to heal people, create harmony and peace, pray for the unfortunate and unite the hands of different nations! I have been reading and getting non-stop news on religious discrimination by CTA and H.H.D.L office. Monks, layman, children has been discriminated openly and life threatening for practising Dorje Shugden, they are beaten up, some are killed, just because CTA and H.H.D.L said so, this is terrified! Never before, there are ample evidence pointing directly CTA and HHDL’s office is behind all this crime…..i beg the mercy of Avalokitesvara, please release the pain of these people lifting the ban immediately. I really wish and appeal to all people on social media to re-post and share this article creating awareness, so that innocent people in Tibet, India, Nepal and all over the world can stop the suffering created by CTA and HHDL’s office immediately. if there is no ban, why are the DS practitioner are being discriminated and being persecuted? 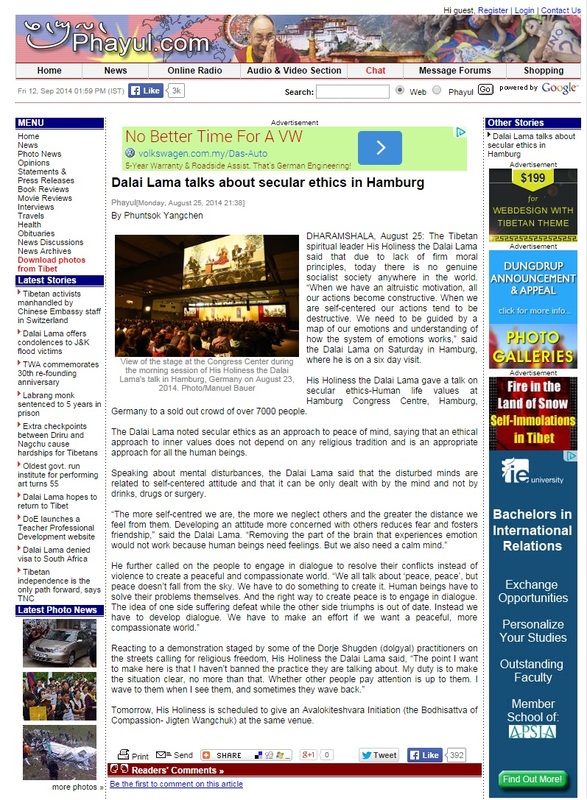 Lies after lies are being spread to cover the real issue of religious discrimination by the CTA, and if it is true from what HHDL say that there is no ban on DS practice, then i would think CTA is the culprit behind all the discrimination and ban enforced to the Tibetan community in India who are practicing Dorje Shugden. I sincerely hope H.H. the Dalai Lama and his chorus do not continue going around saying that there is no ban. Enough is enough. 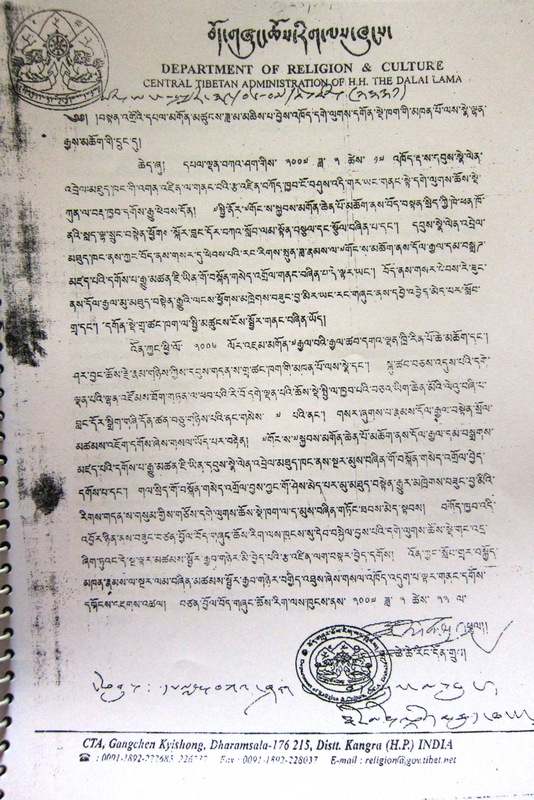 * A letter from the Himalayan Buddhist Cultural Association & Himalayan Committee For Action on Tibet to the various monasteries and associations, clearly articulating the ban on Dorje Shugden, pressuring the monks to swear against Dorje Shugden’s practice, and discrimination against firm Dorje Shugden practitioners. 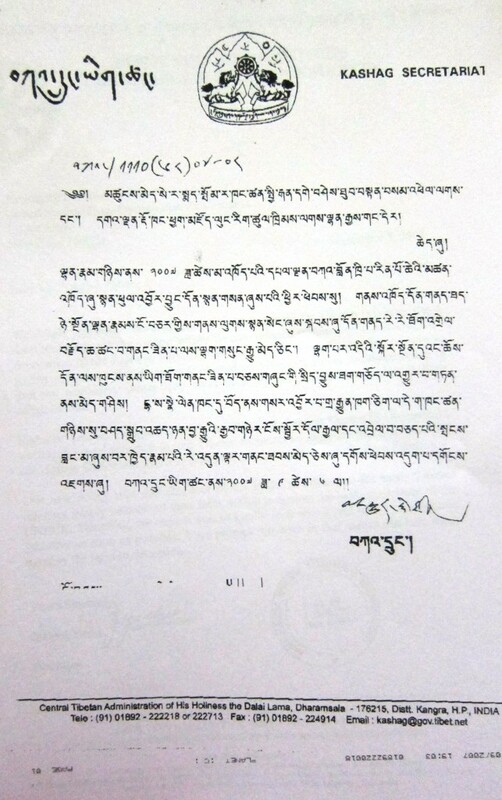 A directive from the Tibetan Government’s Department of Religion and Culture barring the issuance of travel recommendation letters for Dorje Shugden practitioners. * In 1996, the Tibetan Government in Exile’s Department of Health issued a directive to its employees to give up Dorje Shugden’s practice or resign from their jobs – PROOF OF DENIAL OF FREEDOM TO EQUAL TO EMPLOYMENT OPPORTUNITY. Thank you DS.com for gathering, as well as providing all of this evidence of discrimination and religious segregation. There should be no doubt left in the minds of others what the situation has been / still is like for Shugden practitioners in the exiled community. There is definitely a ban going on. All the evidence is there as shown. What are they denying? In the first place, they said that the practice of Dorje Shugden will jeopardise the fight for Tibetan Independence and also harm the life of the Dalai Lama. Therefore the ban was enforced. Now that more and more facts about Dorje Shugden is revealed, the story is changed. They now say that there is no ban and that Shugdenpas are funded by China. Where is the evidence for their claim? This is all a cover up and to confuse others. The truth will prevail. These are excellent solid evidence to proof the stance of Dorje Shugden practitioners. Whatever claims that have been made has to be backed up by evidence to prove that it is true, and there can be no refutal that there is a ban against the practise of Dorje Shguden through this article. If this was brought to court, the verdict would definitely be in favour of Dorje Shugden practitioners. Whatever claims made by the CTA or denying that there is discrimination against Shugden practitioners is a mere lie as the CTA or His Holiness cannot come up with proof for the accounts that they have given. What truth is there if there is no proof, as it is all based on talk. But dorjeshugen.com has provided a platform through this website that highlights all the truth that is happening and backs all that has been shared through solid evidences and proof. And these evidences provide the knowledge for people to see and understand the real situation that is going on. It is so clear to see that there is no access to religious freedom. His Holiness Dalai Lama has always spoken against this practise, and in that alone, he is already telling people to not practise it. Even if he has denied that he has ever said there is a ban, by speaking negatively about Dorje Shugden, His Holiness being a religious leader already puts a message into people’s minds that the practise is bad, and those who do it are bad thus dividing practitioners. If that was not his intention, then he should have not even publicly speak about Dorje Shugden and using derogatory term such as dolgyal in the first place. So what are his intentions by doing so? The truth is out. This crime against the basic right of mankind dealt by the Dalai Lama and CTA has been enforced and the only way to clear it is that Dalai Lama apologizes on the comments made on Dorje Shugden by him and his party, and lift the ban to allow religious freedom. It is clear that those who practice DS are being discriminated and yet the Dalai Lama and CTA kept denying the fact of imposing any sort of ban to this practice. The strategy they use against these practitioners, to suppress them, to threaten them and all sorts of things… and yet they still deny it. With the clear proof of solid evidence, one can see clearly the truth that there is a clear discrimination and ban against this practice. Not only that, they are also violating these people’s basic human rights, not to mention religious freedom as well. Whatever the Dalai Lama has said, shows clear contradiction against the proofs shown and also with these documents, we can see how these practitioners are treated compared to the other Tibetans. Shugden Ban finger pointing true or not true by Pro and Contra Dalai Lama parties does not play any majore role once MW Path is agreed between China and Dalai Lama. The Recognition of this Policy is happening very soon, matter of few years. In this current decade China needs Dalai Lama for its won Stability with Tibetans and Ugyurins. Dalai Lama needs China even more to save Tibet`s culture and its survival. This compilation means alot to bring about awareness to put to an end the illegal and illogical ban on Dorje Shugden. With black and white proof of discrimination by the Tibetan government in exile, will bring justice to the downtrodden Shugden Buddhists and free them from fear and intimidation which they have endured all these 20 years. These definitive proof can bring about religious freedom and break human rights abuses for the Tibetan community. Thank you DS.COM for your kind effort and compassion for this compilation of solid proof. This is really not true there so many proofs about this ban if there is not ban the westerner will not protest about this ban aggressively . Look at the harm that created by this ban so many Tibetan are suffer tremendously so of them have to even give up the DS practice because of the ban it affect their daily life bad the ban also create a lot of disharmony among the Tibetan community, our support will help to lift up the ban so that less people will suffer and we can all spread the DS practice to more people. Lies, deceits, betrayal, assassination plots and attempts, violence, politics, power, money….these are ingredients for a good drama movie. Yet with such evidences read, seen and heard by so many people all over the world, the CTA and the Dalai Lama now insisted that there NEVER was a ban. Despite of what the CTA & the pro Dalai Lama people denying of any ban or discrimination against the Dorje Shugden practitioner, there are clearly tonne of recorded evidence such as letters, photos & real life incident that indicate otherwise. In particular among the Tibetan community in exile, the ban has caused families members being separated, deny of basic social welfare services, no jobs security & living in isolation & fear in a community they once called home. What I had read so far has not indicated that the protector Dorje Shugden or the practitioners are the caused of the disunity & hinderance to the Tibetan caused as claimed by the pro Dalai Lama people & CTA. In fact it was quite the opposite as evidently presented in this article. I urge the CTA to stop lying to the world & themselves because there are real suffering here & the people involve are in every flesh & blood the same as all Tibetan brothers & sisters in the community. If the CTA truly believe in the caused for the independent of Tibet, they must stop the ban & discrimination against Dorje Shugden immediately. What is the point of having independence without unity, peace & harmony among the people? With these proven documents,how is it that there is no ban on Dorje Shugden practice? Please share with others to create awareness of this situation.The downtrodden Dorje Shugden practitioners whose voices are not heard and who cannot fend for themselves in fear of retribution from the community at large. There are plenty of proof of discrimination but I guess the west are turning a blind eye as they are more focused on the global balance of power, secular. The CTA has their own agenda as does the western sponsors of the Dalai Lama. It is not that there i lack of evidence but rather a lack of will to do something about it. As long as the CTA does not do anything violent against the Shugdenpas, the west can conveniently turn a blind eye. So, however disheartening the situation is, it is great that this website has kept the pressure on the CTA and the followers of the Dalai Lama. through education and knowledge, the darkness of the minds of these people can be dispelled. Thanks for bringing us such wonderful articles and keep up the good work.